International oilfield services company, Expro, has launched a new extreme high pressure tubing conveyed perforating (TCP) gun system, delivering the largest perforation hole area available for frac and gravel pack completions. Designed specifically for challenging deep water environments in the Gulf of Mexico (GoM), the Extreme Pressure Series 30,000 PSI TCP gun system utilises super big hole charge technology, providing best-in-class area-open-to-flow (AOF) to support frac- and gravel-pack operations. Delivering 18-22 shots per foot using steel HMX charges, standard casing sizes of 7 inches through 7-3/4 inches, in combination with the 4-3/4-inch OD system, will achieve 6 to 7 inches AOF. However larger casing sizes of 9-5/8 through 10-3/4 inches, utilising the 6 5/8-inch OD system, will deliver 13 to 15 inches AOF. Developed in collaboration with high performance gun system provider, GEODynamics, the system is complemented by Expro’s fully rated dual hydraulic firing heads and drill stem testing (DST) tools for underbalanced perforating applications. These systems offer cutting edge technology to deliver efficient completions, alongside optimal well performance. 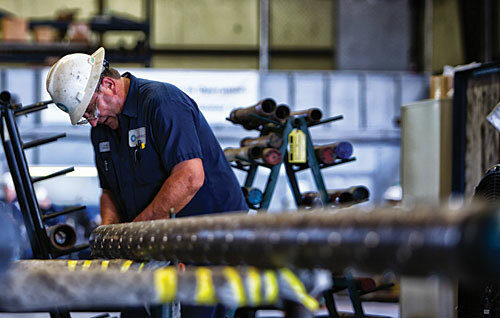 Expro’s TCP operations are supported from its service centre in Broussard, Louisiana, alongside the Company’s broader suite of subsea, well test, well intervention and fluid product lines across North and Latin America (NLA).